Corrosion-resistant Hose Trolley Kits adapt to any size greenhouse or building. All kits include Gilmour Flexogen hose, our best. 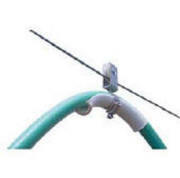 Kit includes hose, aircraft cable, stainless steel pulleys, hose supports, rope clip and turnbuckle. 10 additional feet of hose to make the run. Hose nozzles remain clean, reducing the chance of spreading plant diseases while watering. Couplings are never stepped on or crushed. Can be used with existing hose bibs and nozzles. Corrosion-resistant stainless steel and plastic for long life.